Here’s an area of the country with a very high chance of absolutely no constituencies changing hands at the election. Merseyside has settled – some might say ossified – into a distribution of seats that could look exactly the same the day after the election as the day before. I say the coalition is almost universally disliked, for this is not a part of the UK that is wholly alien to other parties. In 2010 the Liberal Democrats won one seat, as did the Conservatives. And there’s a possibility that both will do so again in 2015. The Lib Dems’ John Pugh will almost certainly hold on to his seat in Southport, where he currently has a majority of 6,024. The Tories came second in 2010, but this is not a seat they are targeting. If the Lib Dem vote collapses anywhere it won’t be towards the Conservatives. 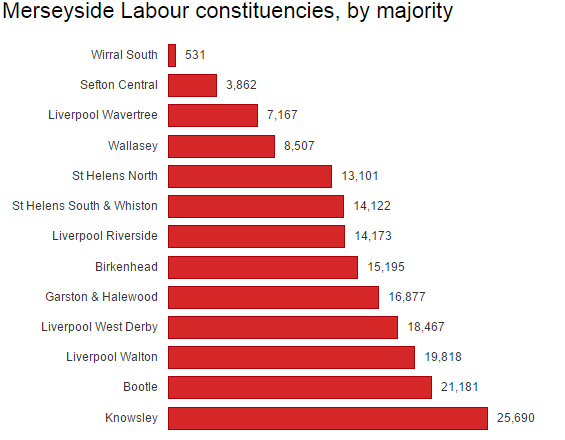 The one constituency that may see a change is Wirral West, the seat of Tory employment minister Esther McVey. She has a majority of 2,436, and would lose on a swing to Labour of 3.1%. 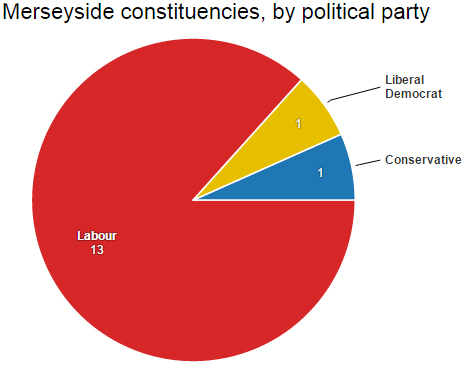 It’s the sort of constituency that would fall to a resurgent Labour party set to form the next government. But we’re no longer looking at that kind of Labour party, which means McVey may cling on. Her personal association with some of the coalition’s most controversial policies, however, may prompt a larger swing against her than elsewhere in the country, and she won’t want to take anything for granted. She will certainly fight a very tough campaign. The Green party will talk up its chances of becoming the “official” Labour opposition in Liverpool, but there is no likelihood of it winning any seats. The same goes for Ukip, for whom this metropolitan-heavy region can reap no rewards. When will the coalition officially come to an end?